Question. Would you watch a total solar eclipse over Stonehenge? I imagine most of you would say “YES!!! !” with a minimum of four exclamation marks. Now granted there will be like a million people with the same idea, so would you still observe it even though you’re a kilometer away? Yeah, I had to put a damper on it, but of course it’s a moot point. There won’t be a total solar eclipse over this famous archeoastronomy site in our lifetimes. So how about the next best thing? Would you watch a total solar eclipse over Carhenge? 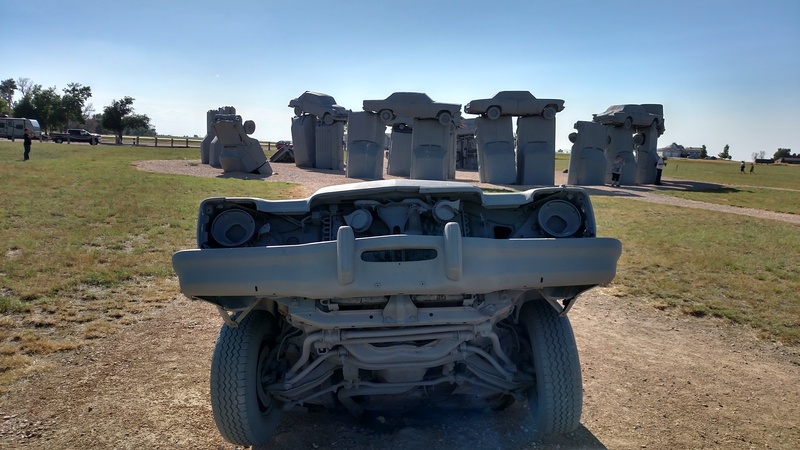 What’s Carhenge? I’m glad you asked. Americans love their cars. Sports cars, luxury cars, compact cars, hybrid cars, trucks, jeeps, SUV’s, RV’s, you name it and someone here is driving it. But not forever. As cars wear out they are sent to car graveyards to be scrapped and recycled. Jim Reinders wanted to create a memorial to his father who once lived on a farm in Alliance, Nebraska. Reinders had lived in England for a number of years and was fascinated by Stonehenge. So he converted part of the family farm into a model of Stonehenge. Stonehenge made out of cars. The proportions are similar with each creating a circle 29 meters in diameter. The size of the automobiles approximates the size of the large Sarsen stones, and includes a heel stone, a 1962 Cadillac buried partly into the ground. They even have a live webcam, where you can see the excitement 24/7 if you wish. Carhenge from the cadillac “heelstone”. But what about the alignments? How accurate are they? The site claims to mimic the summer and winter solstice sunrise and sunset points. My friend Gary who has been teaching the astronomical alignments of Stonehenge to his aspiring astronomy students for many years, meticulously walked around the site taking camera shots from various angles. Although he prefers to take some time to go through the alignments he agrees that both summer and winter solstice sunrise and sunsets are aligned correctly. This picture of Gary is taken in the bar in Riverside, Iowa where Captain Kirk will be conceived in the future (under a pool table no less). So back to our question. Would you observe a total solar eclipse for Carhenge? You actually have a chance to do that. On August 21, 2017, the total solar eclipse goes right across this slice of Americana. Actually, it’s not far from centerline as it enjoys 2 minutes and 30 seconds of totality. And the crowds? The population of Alliance Nebraska will be there along with a lot of “outsiders”, but you couldn’t find a friendlier town. We’re probably talking of crowds of about ten thousand. It certainly would make an interesting eclipse experience, and I’m certain there are alignments just waiting to be discovered at the site. Who knows? Perhaps you’ll discover a new alignment of the bright star “Carpella”.